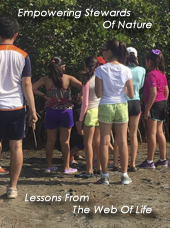 Throughout my adventures in Nature, I’ve heard the words “invasive species” used extensively by environmentally conscious individuals and organizations as well as those government agencies who oversee public lands. The context in which “invasive species” is used is typically with a connotation of being bad — something that needs to be destroyed. Being the “suspicious scientist” type, I’ve given some thought and done some research on the subject of invasive species which I would like to share with you. My purpose in writing this blog is both to present my views and to solicit your views. Whether you agree or disagree with me, I’d like to hear from you. 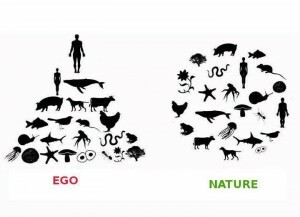 those factors that negatively affect the human race and not necessarily the environment. There is no population control of our own invasiveness. Yet, we try to control the invasiveness of other species. Invasive species are essential to the process of evolution. Many times, evolution takes place when a species moves on to new territory and adapts to a new environment. Darwin’s finches in the Galapagos Islands are a famous example. Almost everything on earth is an invasive species. Therefore, we must be careful when we employ a negative connotation to the words “invasive species”. As I will point out later in this blog, there are some invasive species that do a great job in controlling other invasive species. Researchers at the Center for Limnology at the University of Wisconsin–Madison found that invasive species follow a “nearly universal pattern in ecology — that invasive species are rare in most locations and abundant in a few.” The study’s lead author, Gretchen Hansen, notes that “high abundance is the exception, not the rule.” The study suggests that invasive species management should focus on those exceptions where the invaders do in fact spread like wild fire. The study goes on to suggest that managers try to identify invasive species “hot spots” where they are prolific and then spend conservation funds where it will have the greatest impact. Recently, I spend two days at the Fish and Wildlife Service bird sanctuary at Bosque del Apache near Socorro, New Mexico. It was a wonderful time watching and photographing thousands of migrating birds. The preserve offered a really great tour of the facility which was conducted by very capable volunteer docents. Part of the tour addressed the issue of the invasion of salt cedar into this human engineered wetland. Information was offered on the many bad things about Tamarisk. I have a tendency to check out the science behind the information from tour guides that they have acquired during their training by their handlers. But, the tour guide was so convincing that I believed the information that was offered about the negative aspects of Tamarisk as an invasive species. I believed their information until I found this web site and video. I find myself deeply disturbed about the means by which some organizations attempt to eradicate an invasive species. To me it seems that the bad consequences of poor eradication methods is far greater than the effect of the invasive species. Due to human insensitivity and an ignorance regarding the interconnectivity in Nature, government funds have been used to “manage” our environment and sometimes create ecological disasters. What is not understood by many of Nature’s stewards is that it is impossible to manage Nature. There are some recent examples of questionable means of killing off invasive species. Despite the lessons taught by the Rachel Carson story, the US Department of Agriculture has chosen to fight off a Buffelgrass invasion by employing the aerial spraying of Roundup – a common weed killer. Much like the folks in Rachel Carson’s day, these people seem to be sure that their aerial spraying will stop the invasion of Buffelgrass without harming anything else. There is no doubt that Buffelgrass is an species that meets the definition of invasive species because it was introduced by mankind through cattle ranching and grazing operations (yes- the same people who now want to kill wolves and get rid of the sage brush ). But, the proposed cure is worse than the effect of the invasive species. 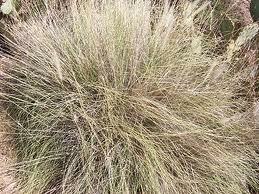 Here is a great video on the anthropomorphic perspective of the invasive Buffelgrass. In another example, the US Fish and Wildlife Service at their Bosque del Apache nature preserve used chemical weed killers to killing off the Tamarisk (Salt Cedar) that lined the edges of their artificially created wetlands for birds. Earlier, the US Park Service, in cooperation with others, established a Tamarisk eradication program along the banks of the Colorado River. They also used herbicides. However, Nature seems to have offered a control of its own. The Tamarisk Leaf Beetle has appeared. It can selectively kill Tamarisk and is apparently doing so along the Colorado River. I was recently told that the Tamarisk Leaf Beetle is now starting to appear at Bosque del Apache. 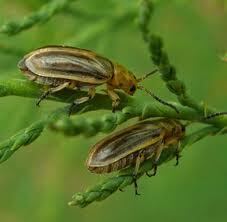 I find the story of the Tamarisk Leaf Beetle most interesting because the beetle is an invasive species. As it turns out, this invasive insect is considered beneficial to man because it is killing out an invasive specie that mankind wants to eradicate – the Tamarisk. The lesson, as I see it, is that passive restoration using certain kinds of invasive species is a real and a viable approach to resolving certain ecological issues that mankind wants to control. In other words, let Nature take her own course. I’d love to hear from you on the subject of invasive species. 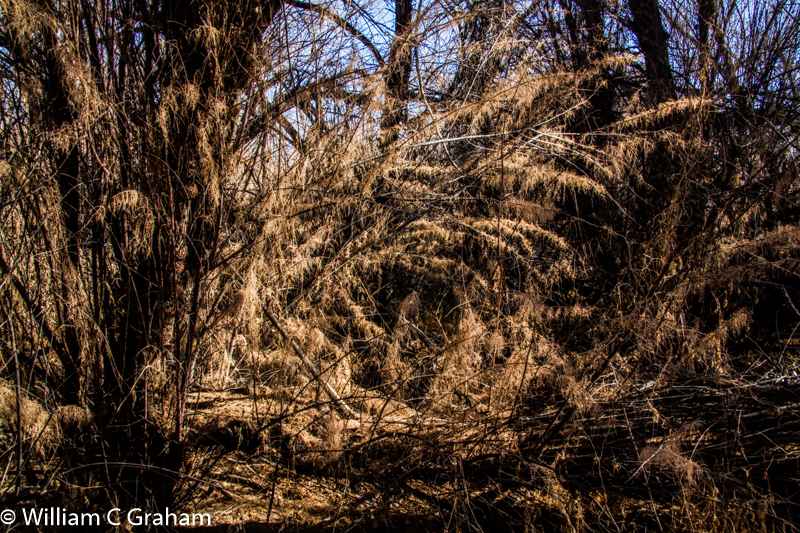 One of my loyal readers, Garry Rogers, just published a wonderful post entitled Outdoor Recreation Aids Invasive Plants . His perspective in this article is a must read for everyone interested in this subject. Shortly after posting this blog post, I received a tweet noting that I was only telling part of the story. I completely agree. My intent was to offer my slant on parts of the invasive species story that are not usually told. I do want to clarify that I do support responsible and fully informed eradication of invasive species when the scientific evidence strongly suggests same. Great skepticism! The beetle story is more complex and nefarious. USFWS or BOR introduced the beetle to control Tamarisk upstream of Glen Canyon, with the assurance that it would not spread south, where Tamarisk is important breeding habitat for the Southwestern Willow flycatcher. It’s appearance at Bosque del Apache means that the introduced bug is way out of control, following the laws of unintended consequences. According to some, invasives may be native or non-native, and the term really refers to something out-of-control as far as the managers are concerned. Good post. Thanks for the feedback Chris. Your experience and insight is very valuable. Great post. Some of the leading institutions and researchers concerned with invasive species have concluded that they can’t do anything about them, so they are using your and similar arguments to turn away from the subject. I think many of the points you make are like the Tamarix story. But Tamarix caught my attention because I know the species well. I grew up on the extended flood plain of the Little Colorado River. My best private place was the extensive Tamarix grove beside the river. In later years I came to appreciate the greater plant and animal diversity in the adjacent uplands where Fourwing Saltbush and Cottonwood mix with other woody species and herbs. There was very little but Tamarix in the Tamarix grove. Tamarix and a few other invasive species that reduce diversity are Eurasian. They might have naturally reached North America one day, but they and the many other troublesome invaders that are replacing our native plant communities probably would not have arrived in a single century. I can’t quite equate Homo sapiens to Tamarix or other invasive species. People weren’t introduced by another species; we got here on our own. We have options that other species don’t have. Preserving diversity is one of them. Biodiversity will return naturally of course, but not for thousands of years while adaptive radiation rebuilds the ecosystem. Homo sapiens could interfere with the process. For now, however, I hope that it will become popular to honor the shrublands and woodlands that once were, and the ones that still survive. Thank you for the stimulating post. Very thought-provoking post and comments. 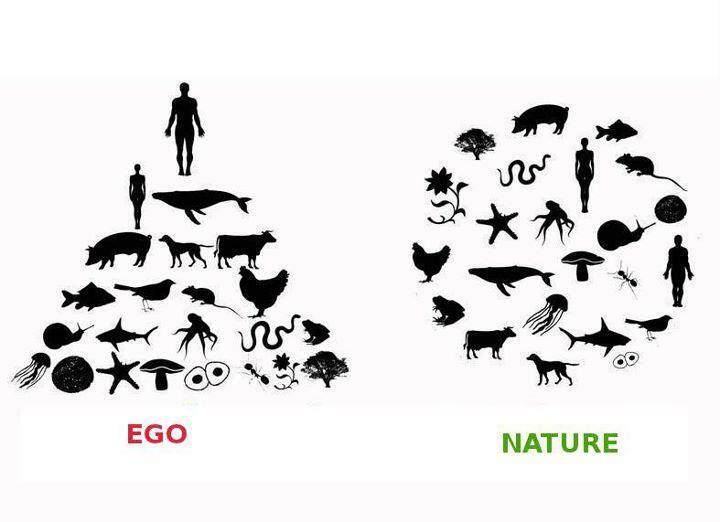 Humans are also nature, not just “in” it. We can be invasive, yet also friendly. Perhaps one of our less stellar qualities historically has been thoughtlessness, so anytime we are actually thinking about these things is a good thing as I see it. I volunteer at a local state park with the plants and have had similar thoughts about “invasive” species, especially when I am asked to uproot and destroy lovely Boston ferns that in my mind, seem to be harming nothing. I also know that some exotics will overrun and damage or destroy flora in proximity. I don’t know the answers, but I do enjoy the conversation. When I saw the title, “Invasive Species,” my mind first went to salt cedar. I’ve loved it for its note of red in the paintable landscape, but my partner, Larry, said it has pushed many native plants which use the same ecological niche out of huge swaths of areas in the Southwest, and indeed, it seems to be everywhere. As with the issue of the spotted owls, which do not compete as well with their larger, more aggressive cousin, the barred owl, where do we choose which species to “tip the balance” on behalf of so they are preserved, and which do we try to eliminate, not that anyone will ever eliminate salt cedar! We are playing God, true, or trying to, an act which is rife with unintended consequences – but what is the cost of standing by? Do we try to hold onto the diversity presented in our lifetime, or do we sigh and let it go? What will be the world our children inherit? Or theirs? 1) The term “invasive species” is area specific. What is an invasive species in one geographic area is not considered invasive in another. 2) The facts about salt cedar are not clear. There is some research that claims that salt cedar does not draw the amount of water as some claim. I find Garry Rogers comment interesting where he says that eventually salt cedar would have migrated to many new geographic locations. But, it is man who has accelerated the process. An excellent piece again. You indeed enjoy playing devil’s advocate when accepted views don’t seen intuitively right–as when the earth’s most invasive species has the nerve to call another species invasive when it does not serve our anthropocentric interests. An important consideration in determining whether a species moving into new territory is truly invasive should be its long term impact upon the wellbeing of the entire ecosystem as it moves toward maximum utilization of all resources in a way that makes life beautiful for all–that aim expressed in the famous Navajo Beautyway chant. Is that the same direction that you see evolution aiming? It is very good to hear from you Jack – particularly on this subject. Yes, I love to kick sacred cows when they don’t make sense. Unfortunately, facts about invasive species are, many times, skewed for self-serving purposes by those who manage public lands and profess to be Nature’s stewards. You’ve convinced me that overuse of pesticides on lawns should be immediately stopped. We need to embrace the dandelions and crabgrass, not kill them needlessly. But as far as salt cedar and buffelgrass go, these plants are changing enture ecosystems in horrible ways. Under the current definition of invasive species, sagebrush is not considered. It never should have been because it is native. Hi Ryan: Thanks for your comments. My point is that any species is not always an invasive species so we need to be careful about painting a broad brush. Salt Cedar is an important owl habitat in certain areas, for example. And, I question some of the means for eradicating Salt Cedar and Buffle Grass when it truly is invasive. 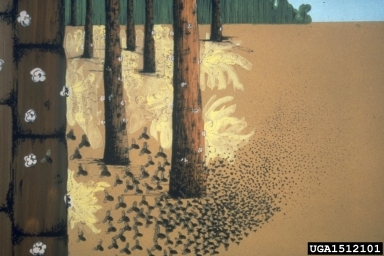 The US Park Service has let loose with a specific beetle species to kill Salt Cedar. What are the implications? And, the USDA is aerial spraying Roundup to kill Buffle Grass.I’m horrified. In one aspect, everything is an invasive (non-native) species because it came from somewhere else. THat is what evolution is all about. So, the issues are not simple. Going off and calling any one plant as “bad” in every case is not an accurate way of describing that plant. The other side, of course, is accepting responsibility for human lack of foresight. I sense that is what you are driving at. I am concerned when I hear comments such as “nuke the carp!” I was at an open forum a few weeks ago in reference to invasive species. This was held in NOAA in D.C. I have fished all my life as have my family before me. I have many times needed the fish to feed my family and have eaten carp. I stood after hearing all day about the negativity towards invasive species and spoke about how the Native Americans and other cultures use these fish. I was told several times that these fish were only brought into America a few years ago and that they are a danger. I know this is not true. People need to eat. The people in the conference have plenty of money to buy food but many people do not. I think there might also be other problems with Native Americans being denied access to carp. The Native Americans have had their rivers poisoned and then they have to get jobs to pay for the fish they should be able to catch. I have just recently learned that NOAA and other agencies are using scare tactics regarding carp. Carp are helpful in many ecological ways. They are the vacuum cleaners and eat many algae and fungi that kill other fish. Sure they need to be fished out but many states are already doing that. Why the scare tactics? There are already fishing plants that are taking tons of carp out of these rivers. Why do we need $200,000,000 in electrical fences built by the Army Corp of Engineers? What economic report has been done to justify the expenditure? What have the state’s done to help fish these carp? What other measures have been taken to help feed people? I cannot find any economic report on the carp done by the Fish and Wildlife Service. Do you know where I could get some information, please. Do you have any information? I have just recently come across this information and am looking into why and how this is happening. 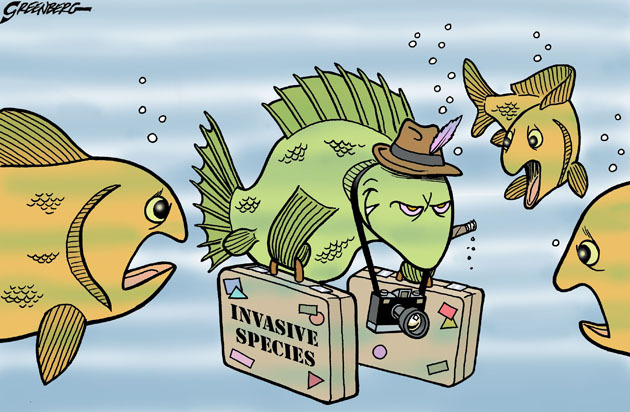 First, I wish to emphasize that I believe that the term “invasive species” is a relative term even though many individuals and government agencies cast a very broad brush and condemn an organism in general terms rather than by region or situation. It is a very overused term. Also, many “invasive species” are so named because they are regarded as pests by certain people. So, I tend to be very careful in using the word. To be honest, I know very little about carp. But, from your description, it sounds like carp should not be described as invasive everywhere. Your arguments are a strong case for regarding carp as NOT an invasive species — at least in many areas. If it were me, I would be targeting those government agencies who are painting this broad brush concerning the carp. I’d first find the name of the appropriate biologist. Then compose a letter to that person — BUT BE SURE YOU FOLLOW UP WITH A PHONE CALL. Government workers tend to ignore the public and you need to be proactive!!!! Best wishes with your fine ideas and endeavors. It’s surprising to know that there is such a thing as invasive species, wherein these species are not native to the area and can result in environmental, economic, and even harm to one’s health. I believe that humans have the responsibility to control the spread of these invasive species so that it will not affect the natural biodiversity of a place, especially for plants or animals that are endemic to that particular area. Thanks for the information about these species; I’ll make sure to pass this along to others so that they will also know what it is and what they can do about it. Hi James: Thanks for reading my post. Over time I have offered several responses to the comments at the bottom of this post. To get a broad idea of my views on the subject of invasive species, you might check out my replies to various comments. Loved the write-up. As a trained mechanical engineer who’s been hanging out more with “nature types” recently, my ears have been filled with “non-native/invasive” species discussions in the last two years. I have been quite skeptical most of the time mainly because of the exception granted to humans and habitat loss caused by humans. A lot of my friends in the bird watching community speak with outright hatred about the European sparrow, starling, and I am concerned with the tone of their discussion and their effect on public policy, and how it affects the life of sentient beings in nature. Wish people are not so easily brainwashed. Hi Nari: Thanks for your comment. I completely agree with you !!!! 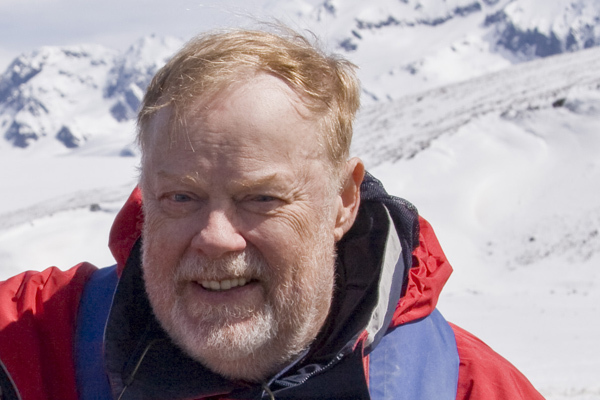 In many instances, species moving from one location to another is a normal process in Nature. The term “invasive species” applies only to those species that bother human beings in some way. The term “invasive species” ignores the fact that everything in Nature is interdependent and interconnected either directly or indirectly. What I am watching about the video in this post – making whole nature an artificiality. What is the value of artificiality over nature? Should people value buffle grass ecosystem that is the result of nature or artificial restoration of saguaro forest? how much intervention will be needed? I mean what is the point of preserving things forcefully? Why we value one life over another? Change is the law of nature. Saguaro will one day die out whether people like it or not. New ecosystem must come. Thanks for your comment Tanzir: I Totally agree. WHere we humans need to focus is on changing our worldview from isolation and control to interdependency and interconnection.